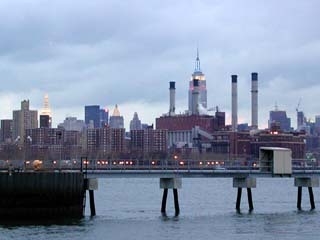 Grand Ferry Park is a wide thoroughfare extending to the waterfront in the Williamsburg section of Brooklyn. It is named for the 19th century Grand Street Ferry, which once carried farm goods and passengers across the East River to Manhattan. In 1802, Richard Woodhull, spurred by the idea of creating a residential suburb of Manhattan, began a ferry service from today’s Metropolitan Avenue to Corlear’s Hook across the East River. He purchased 13 acres of land surrounding the ferry and named the area Williamsburgh around 1810, after Colonel Jonathan Williams (1750-1815), the original surveyor of the site. In 1811 Woodhull went bankrupt, but the idea of Williamsburgh was viable; Noah Waterbury built the neighborhood’s first distillery in 1819, and David Dunham (ca. 1790), called the “Father of Williamsburgh,” began operating a steam ferry in 1827. During the mid-1800s, wealthy professionals frequented the private clubs, beer gardens, and resorts abounding in the neighborhood, while companies like Pfizer Pharmaceutical and the Havermeyers & Elder Sugar (now Domino Sugar) Refineries laid their roots in the area. 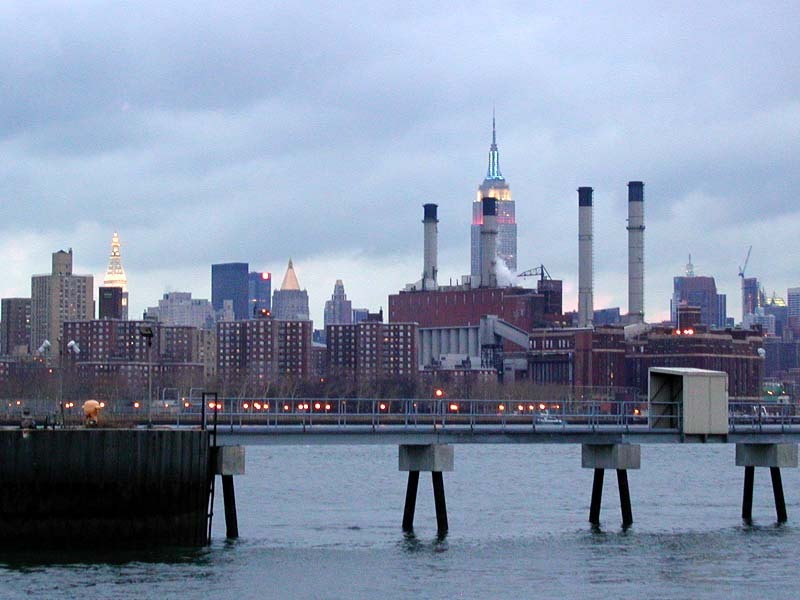 By 1852, Williamsburgh’s population had grown to 31,000, and it was chartered as a city. The City of Brooklyn annexed Williamsburgh three years later and dropped the “h” from its name. The opening of the Williamsburg Bridge in 1903 provided an easy route for the city’s newest Eastern European immigrants to leave the cramped Lower East Side of Manhattan, and by 1917, Williamsburg was the most densely populated area of Brooklyn. The Grand Street Ferry ceased operations in 1918, and the abandoned landing became one of the few stretches of Williamsburg shoreline accessible to the public. 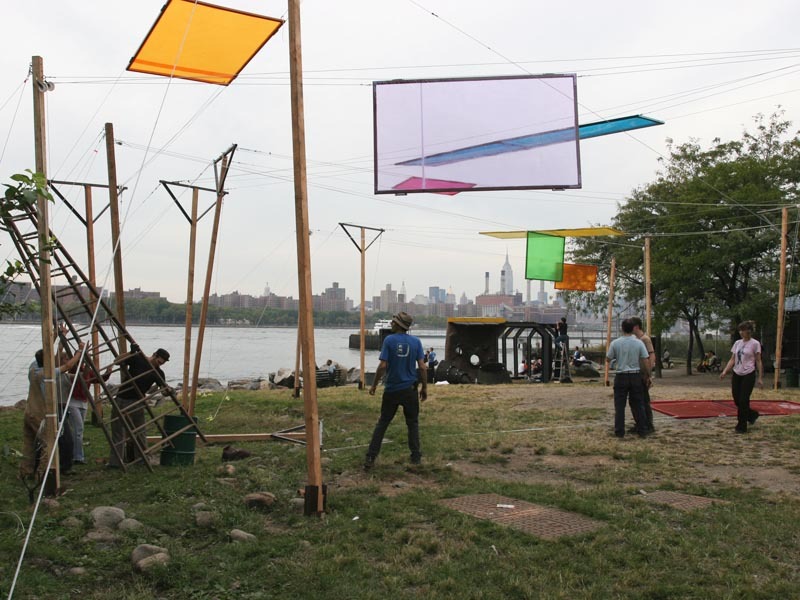 In 1974, the Parks Council, an advocacy group, created an unofficial park in the space using recycled materials. It was known as the Grand Street Park. Finding that there were insufficient funds to develop and maintain the land, the Parks Council requested that the site be formally acquired as parkland in November 1989. Once it was the property of Parks, an official park could be constructed, and the agency would be responsible for its upkeep. The Department of General Services transferred the 1.55 acres to Parks in October 1997. 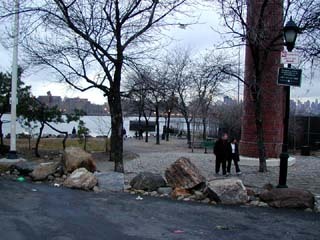 The new park, located between Grand Street, West River Street, and the East River, now called Grand Ferry Park, opened officially on July 9, 1998. It contains benches, a flagpole with yardarm, and a north compass rosette. Shore pines (Pinus contorta), Thornless honey locusts (Gleditsia triacanthos var. enermis), and White ash trees (Fraxinus americana) provide shade and greenery. 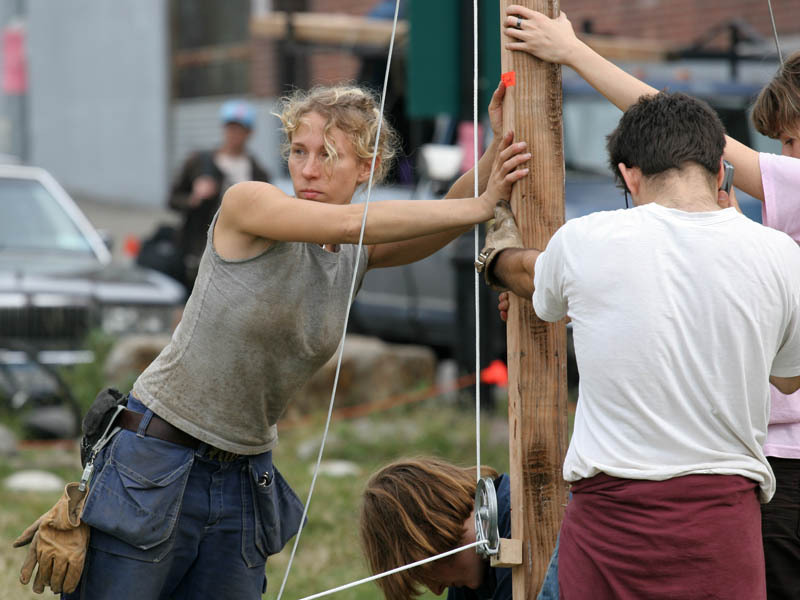 The architect, Marcha Johnson, incorporated historical elements into her design. A red brick smokestack rising above a circular pattern of cobblestones was part of a molasses plant that Pfizer Pharmaceuticals used in the early 20th century for work that led, eventually, to the large-scale production of penicillin. The cobblestones were salvaged from the section of Grand Street where the park was constructed. At the water’s edge, a border of boulders, known as rip-rap, protects the shoreline from erosion and provides seating to enjoy a view of the water and the downtown Manhattan skyline. On one side of the park’s slope, a streambed lined with rocks stretches from Grand Street to the water. When storms flood the street, the runoff flows down the shallow trench and into the river. 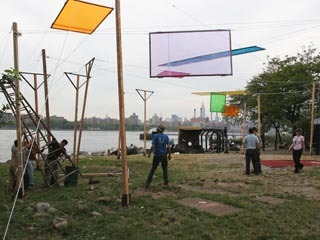 Art installation in Grand Ferry Park. 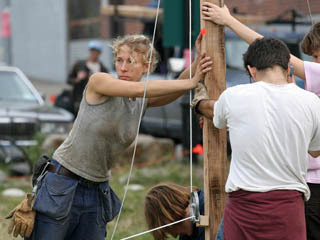 Installing the art in the park. Grand Ferry Park in Williamsburg.